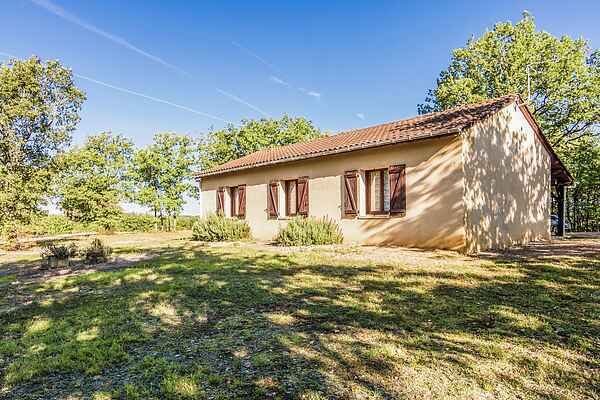 This attractive vacation home is splendidly located on a ridge, close to Salignac-Eyvigues (5km), complete with a gorgeous view over the surrounding fields. You share a sparkling pool, playground equipment , a trampoline and a small volley ball court. Your own home has a covered terrace, a ping pong table, and a sandpit. In the house you will have a lovely seating area and a wooden, open fitted kitchen. If you don't feel like cooking, you'll find a lovely restaurant serving up great local specialties a couple of hundred meters away. An absolute must is a visit to the Chateau d'Eyrignac with its' splendid French style garden. As impressive is \"the pearl of Perigord\", Sarlat-la-Caneda (18km). Your trip on the Dordogne starts at Rouffillac (11 km). You can rent a canoe here to explore the river. A trip on the canoe, or in the car, will take you along charming medieval villages. Domme (30 km) is an excellent example of one of these lovely villages. Here, you will not only find old beautiful houses, but also very impressive caves. Other beautiful places are Montfort (22 km), La Roque-Gageac (31 km) and Beynac-et-Cazenac (30 km).